For 12 years the Music is Art festival has been doing more than just providing a day of free entertainment for the Buffalo community. Founded in 2003 by Buffalo native and Goo Goo Dolls bassist Robby Takac, Music is Art is a not-for-profit 501(c)(3) organization that exists to educate and promote the signficance of music in the community. Within local schools the MIA organization helps to provide instrument donations and refurbishment, music mentoring and educational camps. The festival will run from 10 a.m.–10 p.m. in Delaware Park on Saturday, Sept. 12 and will be free and open to the public. Seventeen stages will be found throughout the grounds showcasing local musicians of every variety as well as artists, dance performances and more. Among the live musicians there will be approximately 80 DJs and 120 bands. Additionally – for the first time in 11 years – the Goo Goo Dolls will close out the festival on the Main Stage followed by a first ever fireworks display. Use the Sequencer’s Guide to Music is Art throughout the day to maneuver through the DJ stages, all of which have been individually curated to taste. Be sure to check out a special DJ set by Qrion (クリョーン) who will be visiting the states from her homebase in Sapporo, Japan. While in high school she released her first two EPs which eventually led to working closely with Ryan Hemsworth. Through her own productions and sets she puts out hypnotic, emotional, dreamscape sounds. 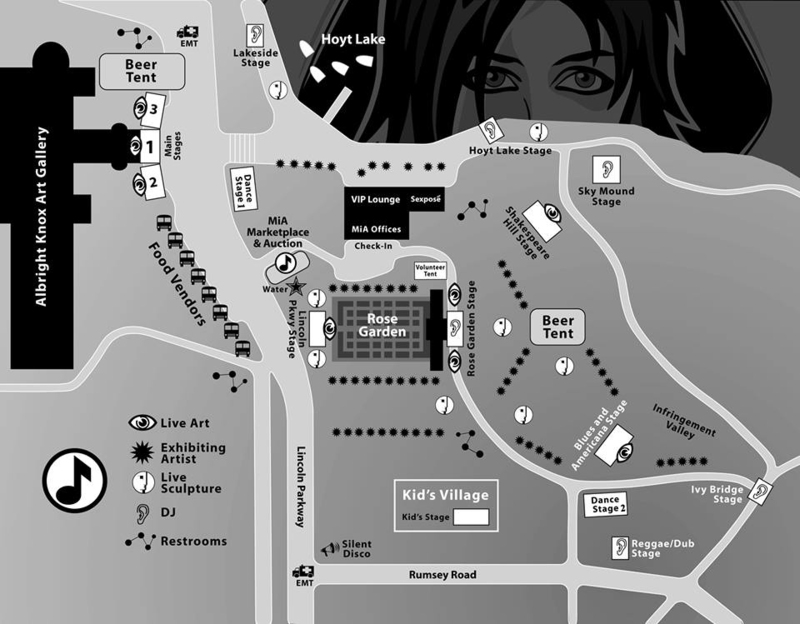 Catch Qrion either from 3-4 p.m. at the Rose Garden Stage or from 8-9 p.m. at the Ivy Bridge. The Lakeside Stage, curated by the Wax Museum Radio, will feature that eclectic variety of sound that WMR is known to showcase. The impressively built sound stack for that stage will be provided by Jolly Wailer. Be sure to check out the Sky Mound Stage, with a bill organized by Buffalo’s own Tobbio. Charlie Abbot, local DJ, photographer and right-hand man for some of Buffalo’s promotional companies, put together the lineup for the Casino Lake Stage. The Ivy Bridge stage has been curated by Keith Harrington, otherwise known as Projex, an artist that uses projection mapping and music to create a truly encompassing experience. Pat Williams, previously of Roboroc and now associated with The Attic, has put together this year’s Rose Garden Stage. Buffalo Rage Community Founder John Darnell has teamed up with Silent Event Entertainment and gathered a crew of performers for the Silent Disco, a brand new feature for Music is Art. If the Reggae/Dub Stage is more your vibe, be sure to stop through any time during the day of the festival.